New York, 16 May 2016 — Months after the final Trans-Pacific Partnership (TPP) agreement was signed by all member countries, United States Trade Representative Michael Froman and other Asia-Pacific Economic Cooperation leaders may consider changing critical terms in the TPP that would favor the pharmaceutical industry when they meet for the 2016 APEC Ministers Responsible for Trade Meeting in Peru on May 17-18, warned the international medical humanitarian organization Doctors Without Borders/Médecins Sans Frontières (MSF). Pharmaceutical companies have been pressuring TPP countries to extend the length of monopoly protection allowed for biologic health products, including many new vaccines and medicines, beyond the currently agreed term of five to eight years. A longer period of "data exclusivity" would delay access to the latest medical advances for millions of people around the world. "Altering the signed TPP agreement to further extend monopoly protections for pharmaceutical companies will delay price-lowering generic competition and keep medicines out of reach of patients and treatment providers like MSF," said Judit Rius Sanjuan, MSF’s US Access Campaign manager and legal policy advisor. "Pharmaceutical companies already enjoy some of the longest monopoly protections of any industry, and governments should ensure that the TPP doesn’t prioritize additional company profits at the expense of public health." Officially, the US and other TPP governments insist that the TPP agreement is final, and national ratification processes have indeed already begun in some countries; but pharmaceutical companies are still pushing to extend protections and have exerted strong pressure on the US and other government officials to open discussions again. "The TPP was signed after more than five years of secret negotiations without public scrutiny; governments cannot continue to hold secretive talks that could end up handing the pharmaceutical industry even more profit-boosting protections while jeopardizing the health of more than 800 million people living in TPP countries," Rius Sanjuan said. Biologic products include everything from vaccines to drugs used to treat cancer and multiple sclerosis. Pharmaceutical companies insist that a longer protection period of 12 years is a necessary condition to ensure continued innovation, but there is well-documented evidence that this is not the case. High prices, rather than guaranteeing continued innovation, actually divert government resources away from funding research and development that meets public health needs. The TPP agreement signed in February already poses a serious threat to access to medicines, with provisions that will extend pharmaceutical company monopolies, block or delay price-lowering generic competition, and keep drug prices out of reach of people and medical treatment providers. 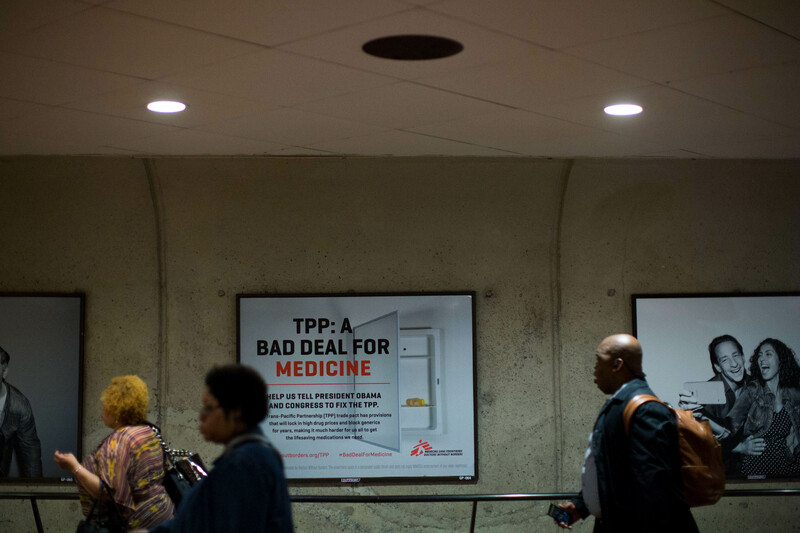 Last month, MSF and more than fifty groups came together to demand that the US Congress reject the TPP as long as provisions that would undermine public health are included. The current TPP countries are Australia, Brunei Darussalam, Canada, Chile, Japan, Malaysia, Mexico, New Zealand, Peru, Singapore, the United States, and Vietnam, but more countries could join, thereby extending these harmful provisions beyond the current TPP countries.